F.R.A.P.P.E. (Fires Rings and Paralyzes Potential Enemies) is a weapon that is designed to shoot foam discs. 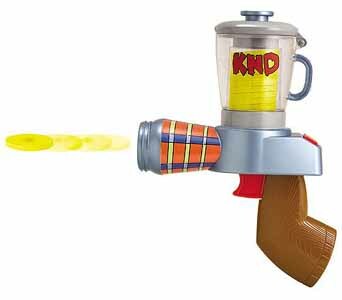 This toy comes complete with a stack of 20 projectiles which can be loaded into the gun by simply lifting the lid and dropping them in. It's so easy to load and fire that even a grown-up can work it. This is really the reworking of an old classic kids toy. Everyone had one of these foam disc guns as a kid, and it's great to see F.E.V.A./Spin Master reinventing the wheel to give today's kids a new version of an old classic. As with the other items in this series, the F.R.A.P.P.E. is designed to look like a child has made it out of any old junk and household appliances laying around the home. 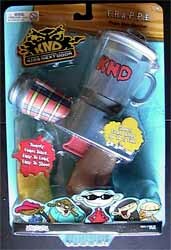 Fans of Cartoon Network's KND animated series will not be disappointed by this well made toy.